So breakfast club is officially a thing, which I’m very happy about. This is the second month I’ve visited a local independent café with some girls from work for breakfast, an event which I love having in the calendar to look forward to. This time we decided to visit The Handle Bar Cafe in the city centre. Above the Bike Zone on St Michael’s Street, we were seated at a lovely spot by the window, and got to enjoy the morning sun as we ate (this does mean that my photos have a few more unfortunate shadows than usual, but hopefully you get the idea). Although the café opened at 8am and we arrived pretty much dead on, we weren’t the only ones with a table, and it got progressively busier as the hour went on, which I was surprised about (why aren’t all these students still in bed?!). Anna also mentioned that whenever she’s tried to come here for lunch, it has been hard to get a table, so the fact that it’s so popular can only be testament to the food. There were multiple vegan breakfast options on the menu, including the obligatory smashed avocado on toast, pancakes, and a chia overnight oats pot. I noticed that the latter was labelled vegan on the menu, but the description said it was served with honey, which is not SFV. I looked at the menu on their website however and the honey was omitted from the description, so perhaps they just haven’t updated their printed copies yet. Certainly worth checking with the waiter either way if you’re planning on ordering this. 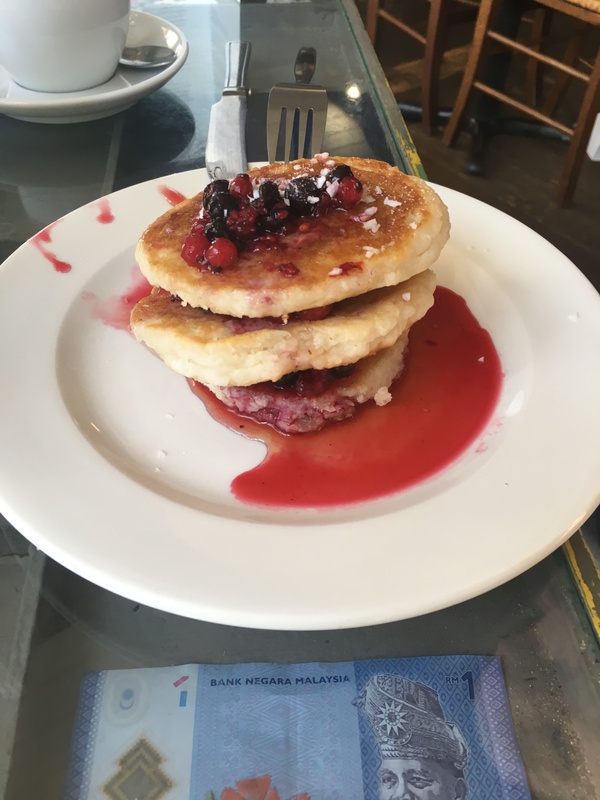 We all ended up going for the vegan coconut pancakes which came with maple syrup and either banana or berries. 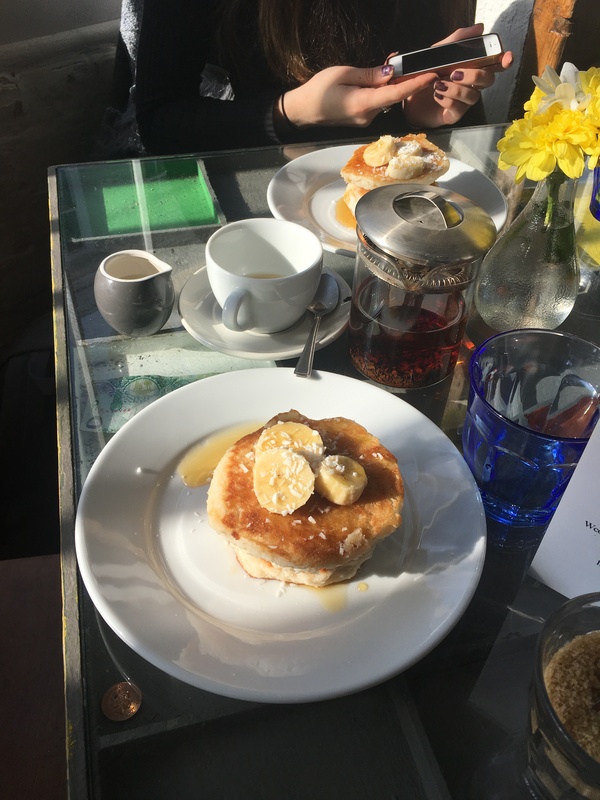 I was really impressed by the size of this pancake stack – I’ve previously quite often found that ordering pancakes out can leave you feeling a bit hungry, but these were really substantial. There was a very decent amount of fruit, easily three quarters of a banana with mine, and with a generous drizzle of maple syrup, this was a really delicious start to the day. I didn’t need to snack the whole morning. I’d be keen to know how these pancakes were made so I could recreate them at home. Very coconutty and no doubt very calorific, but every bite was totally worth it. I ordered a pot of breakfast tea to go along with my food, and there was a choice of various different dairy free milks for a 50p supplement. I got about three cups out of my pot so can’t complain about that at all. In total my meal came to £10, and I think that was very reasonably for the tasty food and friendly service provided. I’ll be coming back!